This is a floated engineered wood floor installation using 11.5mm Serenity Ultimate Underlay™ This is the ideal solution for most sound issues. The underlay is glued down and the floor is floated. This will give good separation between the floor and the building structure by adding extra mass and flexibility. This is the ultimate solution to most noise issues. It shows optimal usage of the assembly elements to use when sound proofing a floor and a ceiling below. This will have the maximum effect on noise reduction. Using Green Glue and Serenity Ultimate Underlay™ this method also incorporates the clips and channel system for the ceiling to make it the ultimate solution for true mechanical separation. Another simple installation this time over a concrete slab floor. This is a floated engineered floor with 6mm Serenity Ultimate Underlay™ This will provide a more comfortable floor as well as reducing any footfall and impact noise in the room. A floated floor over a lightweight concrete (Gyp-crete) base is illustrated here. This will add flexibility. It will help absorb vibration and impact noise that otherwise travels in the structure. This is a fairly simple straight-forward installation and requires no glue or adhesives. This is the ultimate solution to most noise issues. It shows optimal usage of the assembly elements to use when sound proofing a floor and a ceiling below. This will have the maximum effect on noise reduction. Using Green Glue and Serenity Ultimate Underlay™ this method also incorporates the clips and channel system for the ceiling to make it the ultimate solution for true separation. This diagram shows how to use spacing around the perimeter of the room. When finished remove the spacers and fill the gap with Acoustical sealant. Serenity Ultimate Underlay™ is a perfect solution for any floated, glued down or nailed down wood floor. Made from 97% post-consumer recycled rubber, it is not just a "green product," but comes with LEED certification from the US Green Building Council. Our underlay will allow you the beauty and contemporary look of wood floors throughout your project while also providing a sound buffer. Serenity Ultimate Underlay™ is available in many thicknesses, and the selection should be based on your expectations of "privacy". In residential projects the higher the weight of the product is directly proportional to the sound blocking of speech, TV, home theater, children playing and other related ambient noise. If you have no insulation in the ceiling cavity, 1/2" drywall on the ceiling below, and a single layer of plywood for your sub floor, you should be able to hear almost everything from below and from above. In this scenario you cannot overdo it on thickness; minimum 9mm is required to make a measurable difference. With a concrete floor, the heaver material, is able to block airborne noise from above and below much better than simple dryall and plywood. When installing a wood floor over the lightweight concrete you can use 6.4mm Serenity Ultimate Underlay™ for reasonable footstep reduction, and 11.5mm Serenity Ultimate Underlay™ for the best outcome. When in a building that is constructed from concrete, such as a typical hi-rise you will not need as heavy of an underlay to prevent footstep propagation. Sound Proofing Los Angeles offers Serenity Ultimate Underlay™ in 1/8" and 1/4" thickness for just these projects. 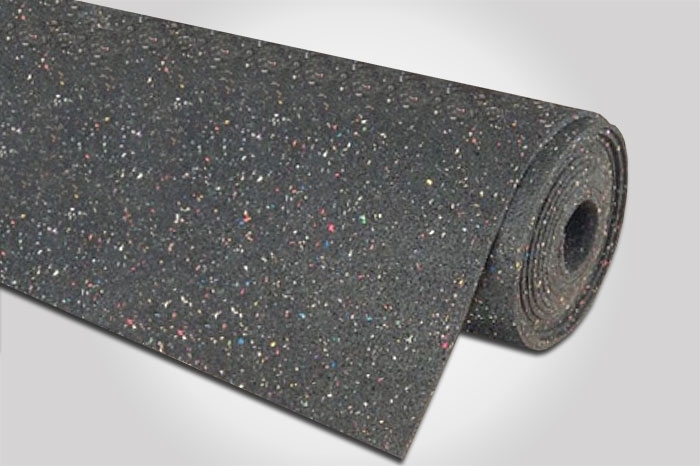 At 1/8" Serenity Ultimate Underlay™ is a green, durable option when compared to other super thin foam products. Serenity Ultimate Underlay™ will not fail over time, does not absorb water, promote mold growth, and when glued down it acts as a vapor barrier. When floated you simple use a poly barrier (clear plastic) and roll our product on top.